The Custom Whistle Flashlight Keychain from AnyPromo is a brandable safety whistle that has a key-chain and a red LED light. This emergency whistle uses a red LED which is ideal for dark conditions. Why is this humble whistle/LED key-chain perfect for emergency situations? Unlike a normal flashlight with white light, the red LED light on this survival whistle is soft on eyes accustomed to the dark, and won't ruin night vision. The Custom Whistle Flashlight Key-Chain is a budget friendly way to add a pop of color and convenience to your next "THANK YOU" give-a-way! This customer voted "Top 100" item is sure to be a big hit with its multi-purpose features. Pick up the Custom Whistle Flashlight Key Chain dual-featured item for easy branding! 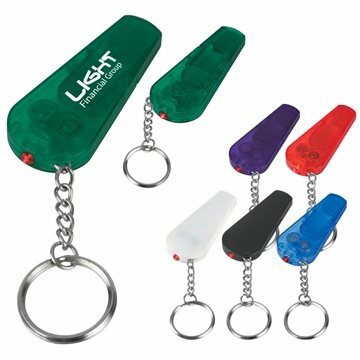 Keychain with a safety whistle and LED light for convenient use at night or in the dark. Features a laser style red light. Button cell batteries are included when purchasing The Custom Whistle Flashlight Keychain. They do come already inserted. Features a user friendly "Squeeze To Turn On" feature for the flashlight. Good value for the price. Young and old both love them. They work for all kinds of events and can hold a lot of writing for personalization. Love the product! And fast customer service! When I asked for the image and mock up they provided it right way and then after I ordered it didn't take them long to get to me!